Anti-government conspiracy theorist turned pro-Trump mouthpiece Alex Jones found his hard-won followings on the web’s biggest platforms stripped away this week. In this day and age, there’s just nowhere left online for a red-blooded patriot to speak his mind. Nowhere, it seems, except for Google+. The frequently shirtless Truth Crusader best known for repeatedly and publicly slandering the survivors of several mass shootings continues post his rantings prolifically to the moribund social network, to basically no one. 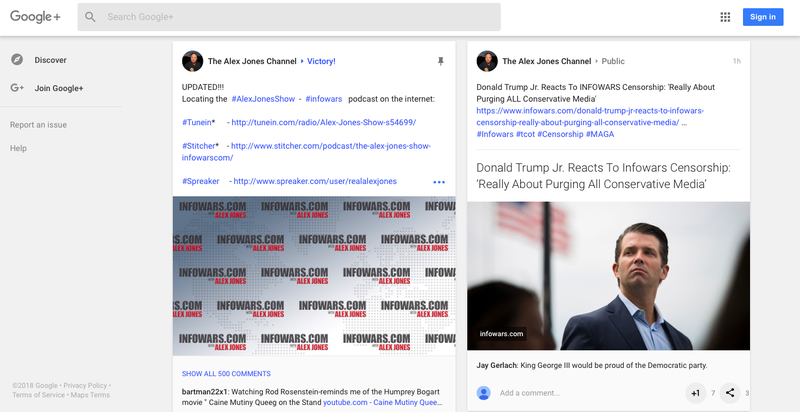 Jones has posted 15 times to Google+ in the past 24 hours, potentially making him the most active participant on the service. A variety of companies, all of which knew exactly what Jones’s brand was and the sorts of claims he made on air, finally caved to years of public pressure in recent days, starting with Spotify pulling episodes of his podcast from their service. Once Apple joined in, the rest of big tech, not to be left holding the bag, marched in lockstep to remove Infowars. Facebook, YouTube, LinkedIn, Pinterest, and even Mailchimp all put the kibosh on Jones’s groundless war for your mind, in favour of their own battle for more money and less public outrage. Even this unified front was staggeringly half-arsed, as we should come to expect by now. Pages associated with hosts and guests of Infowars remain active, most notably those of InfoWars editor-at-large Paul Joseph Watson, whose YouTube following alone tops 1.3 million. And of course, there’s Google+, the platform which, like YouTube, is owned by Alphabet, and which the company itself may be unaware it still operates, let alone that Jones is on it. Anyone who has watched Jones’s marathon broadcasts has probably gotten the impression that deep down, all the guy wants to do is walk into the middle of a forest and scream his head off. What gets him in trouble is anyone hearing a single word he says, and in that sense, Google+ may be ideal rest home for Infowars to live out its twilight years.